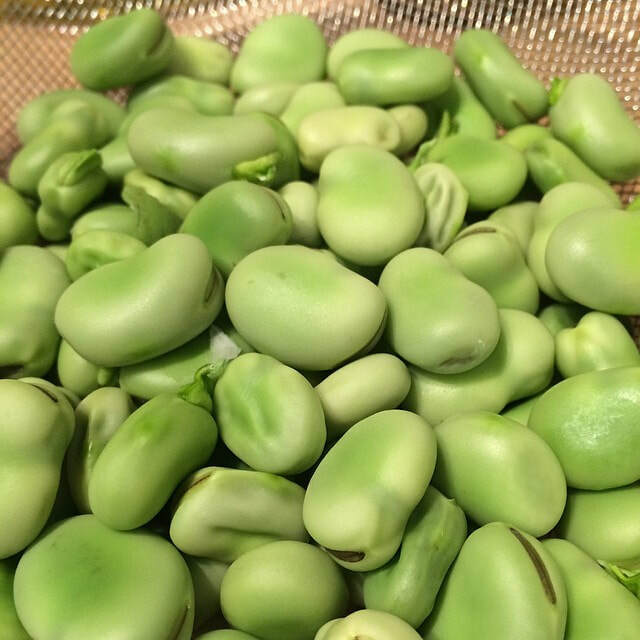 Fava bean flour comes from finely ground fava beans, also known as broad beans. They are a member of the pea family.They are often confused with lima beans. It has an earthy flavor to it and is often ground with garbanzo bean flour. How To Make Your Own: Take dried fava beans, place in high output blender, food processor, or coffee grinder and grind until fine. Pour the garbanzo and fava flour into a medium-sized bowl and mix with the baking powder and salt. Make a well in the center and pour in the avocado oil and water. Mix with a wooden spoon until it is well-integrated and then knead onto a clean work surface 4 or 5 times. The dough should feel oily, but to keep it from sticking to the work surface, sprinkle extra garbanzo flour on the rolling pin, dough and work surface. Divide the dough into four pieces. Roll the dough out into long, irregular shapes onto parchment paper. There’s no need to be precise here just flatten out the dough to about 1/8″ thick. Baste with avocado oil and gently press the thyme into the dough so it sticks into it. Stab several times with a fork and sprinkle lightly with sea salt and Asiago cheese. Bake for approximately 5 minutes or until its golden brown. You may lengthen time to 10 to 15 minutes if you want it extra crispy, but keep a close eye on it. Drizzle lightly with honey and cut into pieces. Note: If you don’t have a pizza stone, a baking sheet covered with parchment paper will work just fine. Other additions or substitution: Add black olives, kale, sunflower seeds, and/or sesame seeds; try herbs such as rosemary or marjoram. Play with it and enjoy!